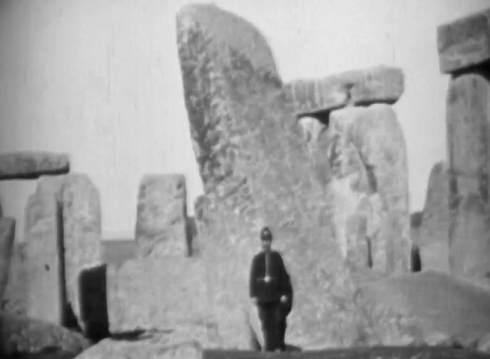 #Stonehenge on Film – 115 years ago! Stonehenge a mere 115 years ago was obviously a very different place from what we see today. No fences, no visitor centre, no interpretation signs, no caravans or campers on the by-ways. The British Film Institute have a new web site, Britain on Film, which allows browsing and searching on a map for old films, from the mid-1800’s (if you’re lucky!) through to the present day. Many are free to view, for others there is a modest cost. 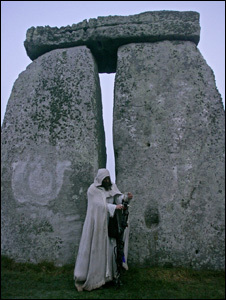 So far, there’s only one film showing Stonehenge, dated from 1900. It shows a brief panorama across the stones, where a solitary self-concious policeman is on ‘guard’ duty for a single visitor. Imagine if that ratio of police to visitors were to be in place today!